Wale!!! Pronounced WAL-LAY!!! http://www.myspace.com/wale One of my favorite upcoming rapper’s in the game right now. I got a chance to interview WALE over a week ago. He’s coming to the burgh and guess what! I won’t be in town F*$%!!! But I’m glad I got to catch up with him. 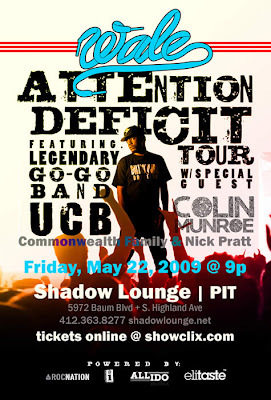 We talk about his time at Robert Morris, hangin out in Oakland, hooking up with girls at Chatham College and of course his first show here in the burgh at the Shadow Lounge!! !